Sponsor: King Ferdinand and Queen Isabella of Spain. King Ferdinand and Queen Isabella had initially told Columbus they could not sponsor his trip, as they were financing a war with the Muslims. Once Spain conquered Granada, the last stronghold of the Muslims, they were able to finance the trip. Kind Ferdinand and Queen Isabella hoped Columbus would bring back gold and goods from his travels, as well spread the christian religion. Columbus' Motivations: Columbus hoped to find a Northwest passage to Asia, where he hoped to collect gold, spices and silk for trade. Columbus also hoped to spread Christianity. First Expedition: Columbus sailed in August 1492 with the Nina, Pina and Santa Maria. Columbus sailed for 36 days and landed in the Bahamas, claiming it for Spain. Columbus then sailed to Cuba and Haiti/Dominican Republic, which he believed to be Asia. Second Expedition: Columbus set sail September 24, 1493. Columbus sailed to the Haiti/Dominican Republic, Puerto Rico, and Cuba. Columbus enslaved 560 natives. Slaves were shipped to Spain. Around 200 slaves died on their travels. The natives left behind were required to find gold every three months, if they did not, their hands were cut off. Third Expedition: Columbus set sail May 30th, 1498. Columbus sailed to the Canary Islands, Cape Verde, Trinidad, and parts of South America. 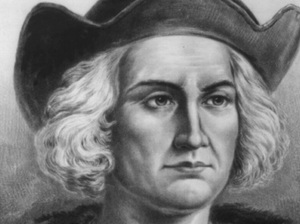 Columbus' Arrest: Columbus was arrested in 1500 and removed from his travels. A number of returned settlers lobbied again Columbus, accusing him of mismanagement. Columbus was eventually set free. Fourth Expedition: Columbus set sail June 15, 1502. Columbus sailed to Haiti/Dominican Republic and Central America. After battling the natives on his quest for gold, Columbus and his crew found themselves stranded in Jamaica. Help finally arrived and Columbus sailed back to Spain. Trade: Columbus brought corn, potatoes, tomatoes, pigs, horses, and natives back as slaves to Europe.